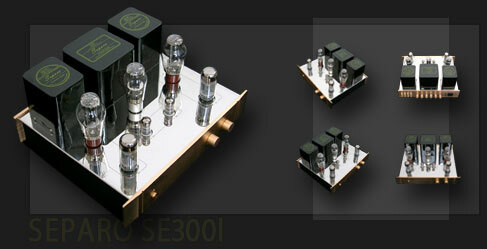 Pacific Creek SE300I is a stereo single-ended 300B integrated amplifier conservatively rated at 10 Watts per channel. Zero global negative feedback (NFB) ensures the most detailed reproduction of sound. Without NFB to cover up distortion or other imperfections, all components had to be carefully chosen to achieve the technical specifications below. SE300I features labor-intensive point-to-point wiring, 5Z3 tube rectifier, double chassis with mirror treated stainless steel surface, and 8 mm (5/16") front and back panels.